HAMTRAMCK, Mich. – Michael Ochab’s 20-year streak of rooting for the Detroit Tigers as part of the opening day crowd is coming to an end. Home opening day this year falls on Good Friday, April 10. 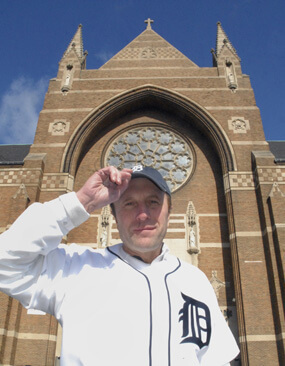 As the first pitch crosses the mound at Comerica Park, just after the 1:05 p.m. start of his beloved Tigers facing off against the Texas Rangers, Ochab will be in St. Florian Church for Good Friday services. He and his eight siblings grew up in the parish, attended the grade school and high school, and he said he spent years there as an altar server. As it turns out, each of the 30 teams in Major League Baseball play on Good Friday this year, though not all are afternoon games. When the Tigers’ opening day fell on Holy Thursday in 2004, Mr. Ochab was there as the Tigers beat the Minnesota Twins 10-6, “but it didn’t really feel as festive.” After the afternoon game, he headed to Mass. Jesuit Father Mark George, pastor of SS. Peter and Paul Parish in Detroit, said being within walking distance of Comerica Park and Ford Field, home of the Detroit Lions football team, is an opportunity for his parish. “We’re trying to make sure all the hotels in the area know we’re here so people can plan for Palm Sunday and Good Friday while they’re here,” he said. This year basketball’s Final Four game will be played at Ford Field, an indoor stadium, on the weekend of Palm Sunday. He was an associate pastor in Cleveland two years ago when the opening day for the Indians fell on Good Friday. Although the game was started, it couldn’t be finished and was called because of a snowstorm. “Not only was that game snowed out, so was their whole first series. Was it because they tried to play opening day on Good Friday? That’s one interpretation,” he said with a laugh. Five blocks from Comerica, Spiritan Father Ed Vilkauskas, pastor of Old St. Mary Church in Detroit’s Greektown, said having opening day on Good Friday “is kind of appalling. “I think it’s a pretty big affront to Christians,” he said. “It’s one of the most sacred and solemn days of the Christian calendar and to do that is insensitive to our faith. “Not too many years ago, stores actually closed noon to 3 p.m. Even banks were closed,” said Father Vilkauskas. With the church so close to the ballpark, it means “we’ll be massively affected by the traffic,” he said. While many will walk to church from their downtown offices, regular parishioners who come in from the suburbs “may be turned away by all the traffic,” he said. Father Vilkauskas said he is hoping the traffic flow will be much clearer at 8 p.m. Good Friday when the church presents the “Stabat Mater” (“Sorrow of the Blessed Mother”) by Franz Joseph Haydn with a soloist, choir and orchestra. While Mr. Ochab said he’s hoping others also pick Good Friday services over the game, he knows the already-sold-out stadium will be filled with people of all faiths.